Carbohydrates offer a ready source of enantiomerically pure starting materials. They have been used for the imaginative synthesis of a wide range of compounds, and have been found to be effective chiral auxiliaries which enable the introduction of a range of functionalities in a highly enantioselective manner. 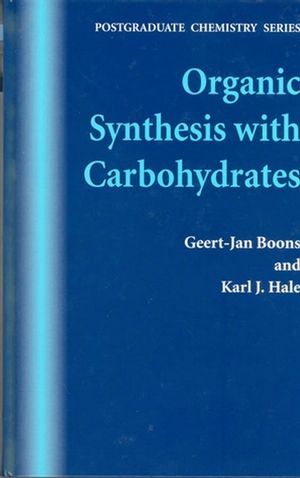 In a subject dominated by volumes at research and professional level, this book provides a broad understanding of the use of carbohydrates in organic synthesis, at postgraduate student level. Emphasis is placed on retrosynthetic analysis, with discussion of why a particular synthetic route has been chosen, and mechanistic explanations are provided for key and novel reactions. Wherever possible, the authors highlight points of general significance to organic synthesis. Selected experimental conditions and reaction details are incorporated to ensure that information can be utilised in research. GEERT-JAN BOONS, PhD, is Franklin Professor of Chemistry and Professor in the Complex Carbohydrate Research Center at the University of Georgia. He is on the editorial boards of several journals on carbohydrates, including the European Journal of Chemistry and the Journal of Carbohydrate Chemistry, and is also coeditor of Carbohydrate-Based Immunotherapies and Vaccines. KARL J. HALE obtained his Ph.D in Synthetic Carbohydrate Chemistry from King's College London in 1985. He is a professor in the School of Chemistry and Chemical Engineering at Queen's University in Belfast. Professor Hale has been the recipient of a number of prestigious learned society awards, fellowships, and named lectureships, including the 2012 Royal Society of Chemistry All Ireland Symposium Lectureship. Part A: Structure and Synthesis of Saccharides and Glycoproteins. 1 Mono- and oligosaccharides: structure, configuration and conformation. 5 The chemistry of O- and N-linked glycopeptides. Part B: Natural Product Synthesis from Monosaccharides.